AddMovie | Mac App Storeのアプリ検索・ランキング BuzzMac! 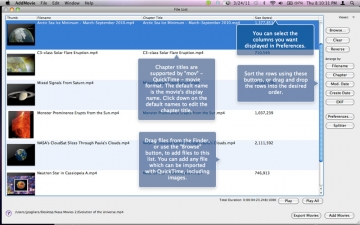 Join movies: Simply drag the movies you want to join from the Finder into the file list window, then reorder them as desired, using drag and drop. Click the "Add Movies" button to combine them in the same order. 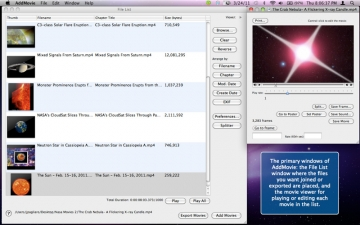 Export movies: Exporting is just as easy. Select the export format in Preferences, add the movies you want to convert to the file list, then click the "Export Movies" button. 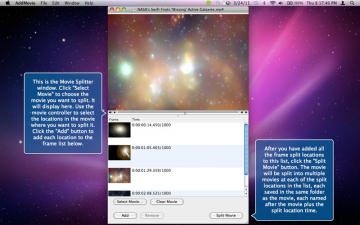 Split movies: Open the movie to be split in the splitter window. 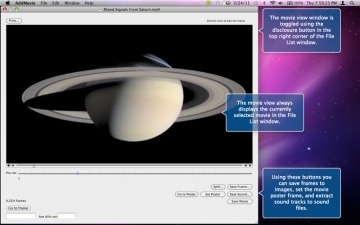 Then use the movie controller to select the "split" times by moving to those parts of the movie. When all the split points are chosen click the "Split Movie" button and you're done. • Slow down movies and sound!